“There is no work here,” he says. “At school, we learn only Turkish. No Kurdish.” It's a story we will hear over and over again on this journey, now we're in the part of Turkey unofficially known as Kurdistan. The Kurdish language was banned by the state until very recently. Town names were changed and Turkifised. Kurdish names were banned for children. It was illegal to speak Kurdish at school, or to print books in the language. It was a very successful campaign, most adults today either do not remember, or never learned the language. “Do you hear something?” I ask Hrach. 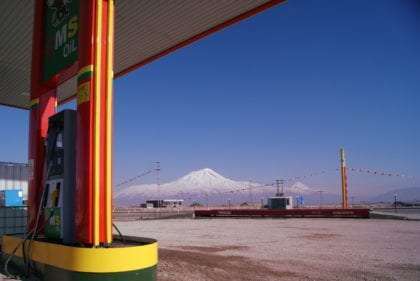 There’s nothing within sight but snow, a towering Ararat, and a deserted looking petrol station. We pause to listen. It’s coming from the petrol station. “Chaaaaaaaaaay!” A man stands in the doorway, waving at us. I laugh. This is so typical of Turkey. “Shall we drink tea?” I ask Hrach. 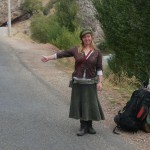 “I know, I know.” We’ve only had one ride today, a car we stopped the edge of Doğubeyazıt. “Istanbul!” the driver had declared cheerily when I asked where he was heading. Unfortunately, we weren’t, or this could have been the best ride I’ve had in years. Instead, he brought us to the first junction, where we now stand, deliberating. Two other guys slouch on a small sofa in a little office. One of them disappears to make the tea and we sit down. I converse with them in Turkish as best I can, answering the inevitable questions about who we are, where we’re from and what the hell we’re doing at the cold end of Anatolia in the middle of December. The guy with the gold teeth seems disappointed that we don’t speak Russian. He speaks five languages, none of them English, “but I never went to school!” he tells me, proudly. He learned all of his languages while working in different countries. I’m impressed. One of the others is a chef, working at a restaurant tucked behind the petrol station. The fact that he isn’t even there, but sitting here smoking, shows how busy the restaurant is. These guys seem almost terminally bored. Every ten minutes or so a car rolls into the petrol station and the man with gold teeth goes out to fill their tank. The third time this happens, he comes back to get us. “Go Van now!” he tells us. We grab our bags and dash over to the car, where a slightly bemused man greets us. It’s only a couple of hours to Van. I watch the temperature gauge on the dashboard drop lower and lower. We pass by a small town called Çaldıran. It’s -11 outside. Sheets of ice hang from roofs in crystal spears. The town exists in what appears to be a permanent cloud. Our driver tells us it will be -40 in January. “There is no work here,” he says. “At school, we learn only Turkish. No Kurdish.” It’s a story we will hear over and over again on this journey, now we’re in the part of Turkey unofficially known as Kurdistan. 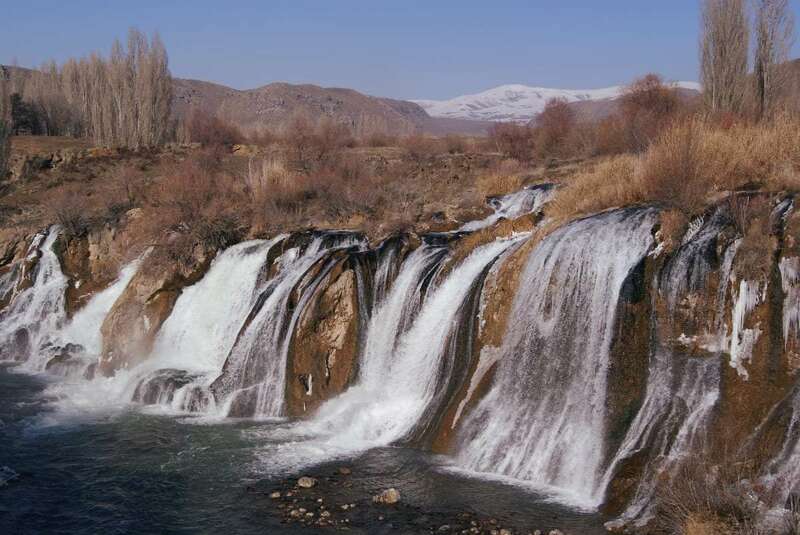 The Kurdish language was banned by the state until very recently. Town names were changed and Turkifised. Kurdish names were banned for children. It was illegal to speak Kurdish at school, or to print books in the language. It was a very successful campaign, most adults today either do not remember, or never learned the language. “Shelale,” our driver says suddenly, pointing further up the road. I have no idea what this word means. “Shelale! Su. Shelale.” He mimes something with his hands. Ten minutes later, we drive into a small carpark. I will never again forget what şelale means, and this is a particularly beautiful one.